Remember our Kickstarter last year? The super succesful one that you guys helped us do so that we could produce this awesome little book available now at the Hivemill? Well, we had some reward tiers for that Kickstarter, and the biggest reward on there was us working with that backer to produce a short exclusive comic for them. This is that comic! Originally, it was only meant to be seen by that backer, but he's allowed us to share it with the world! 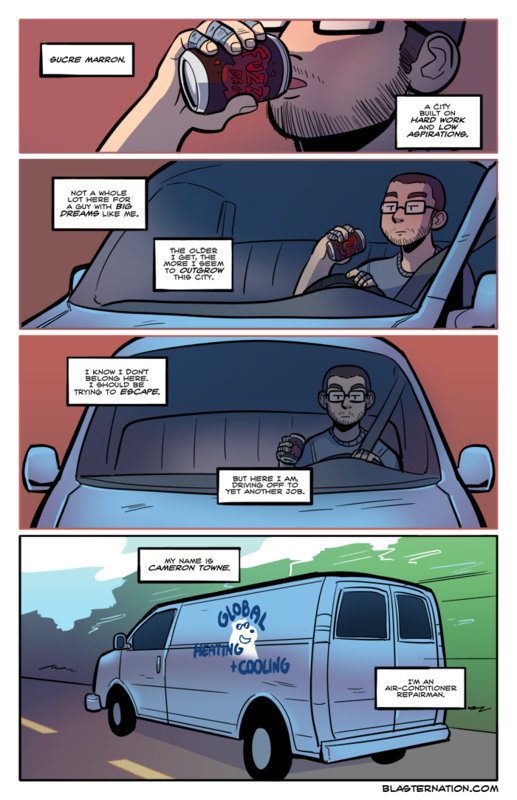 And since that comic is Blaster Nation-related, we thought you all might be interested. If not, well, don't worry too much. This comic's only 11 pages long and we're now updating three times a week, so it'll be over before November ends. Still, I think there's plenty in this short chapter that I think you'll like! A few weeks ago, I did a review on Lisa, the Painful RPG. It's a flawed but enjoyable game that I'd recommend to JRPG fans and people who love dark humor. I recently played its DLC sequel, Lisa, the Joyful. It's very short and I don't really have much to say about it, so no full review for that. I didn't really care too much for it. The humor, story-telling, and character moments take a backseat to some hokey writing, a forced "goal" that makes no attempt to give you a reason why you'd want to go for it, and an overemphasis on combat. That third part is the worst aspect, considering the combat is now severely downgraded from it's predecessor's chaotic multi-man strategic brawls. Combat in Joyful just seem to rely on the same strategy and item usage ad nauseam, with little incentive to vary it up. I also didn't really care for what they did with some of the returning characters and I feel like the game actively hurts some aspects of its prequel. I kinda wish I just hadn't bothered with it. The Painful RPG is a good but flawed game, but I don't think Lisa as a trilogy is very good, if that makes sense. It HAS got me craving for some more hot RPG action, though. But that'll be a story for a later time. SEE YOU ON FRIDAY. Edit: OH! I should specify that these comics were done by just Leslie and I. No Freeglass inks for the next 11 pages. Go check out what he's been doing on his tumblr!